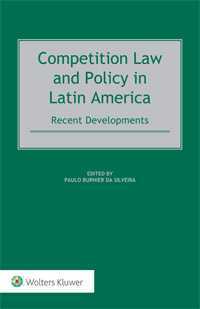 Competition Law and Policy in Latin America: Recent Developments analyzes new competition laws and reforms in Latin America and provides an overview of the interface between competition law and other public policies. The Latin American countries, both individually and as a community, are poised to become increasingly important in the international recognition and enforcement of competition law. Recent policy developments in this region are particularly instructive on cross-border mergers and international cartel investigations. Although this book’s focus is on Latin America, its in-depth exploration of areas such as information exchange among competition authorities, compliance, settlements and remedies are of great value and interest to competition lawyers and policymakers worldwide. There are country-specific chapters on particular developments in Argentina, Brazil, Chile, Colombia, Ecuador, El Salvador, Mexico and Paraguay. This book discusses new trends of competition enforcement in Latin America and thereby helps practitioners become conversant in handling cases with an element of competition law involving Latin American countries. Highlighting the importance of international competition regulatory cooperation, this insightful book offers both practical guidance and food for thought to lawyers at national competition authorities, corporate counsel and other competition law practitioners and academics.